Most people use the word creative within the context of ‘Art‘, where they think that creativity means an ability to draw, use colour and paint, sculpt, or put things together in an ‘artistic’ way. We see it differently. We think of creativity in interior design as innovation – being able to recognise a problem, understand it, figure out the boundaries for the solution, and come up with innovative ideas to solve the problem. This is the art of being an interior designer. Interior design is the alchemy of aesthetics, science, analysis and lateral thinking. 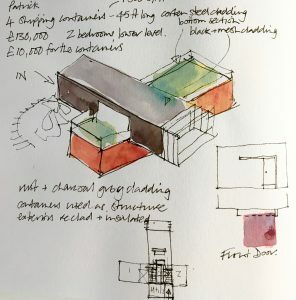 Unlike a fine artist who can be pretty much totally self-indulgent, interior designers always have boundaries to work within – the needs of the client and the users of the space, the building and its history, layout and construction, the regulations we have to obey and of course the budget. Our designs are solutions to all the issues that are raised by these boundaries. This makes design a fantastically challenging and inventive job. Our creativity comes from interpreting all this information, pulling together innovative solutions, and daring to take risks. And this is what we teach. We teach the process – how to think laterally, and be curious about everything around you, and to trust that the ‘process’ will open up the path to the best solution. These are the fundamental attitudes of a designer. Alongside this are the more practical skills that you need to be able to communicate your ideas and solutions. Yes you need to be able to draw, but again it’s not drawing as Art, it’s drawing as a way of thinking and working out ideas, a way to brain dump. 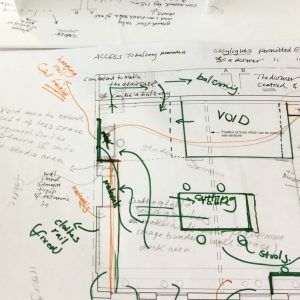 You don’t need to be Picasso, but you do need to draw diagrams, and think more like Leonardo da Vinci with all his bonkers ideas scribbled in sketchbooks. After all, the drawings we produce are not the end product, they are just the means to building an interior. The finished interior is the demonstration of the alchemy. So is interior design Art? No, but it is an art…a skill… that can be learnt. And along with your personal taste and aesthetic can be incredibly powerful, life changing and creatively fulfilling. The Interior Design School has incredibly successful alumni who came to the course never having drawn, or studied a creative subject. But we teach our students to appreciate and use their experience and transferrable skills, to constantly feed themselves with inspiration from the work of other designers and architects, artists, nature, science, materials. Gradually building a toolkit of skills that will all come together to make an interior designer. If you’re thinking about making a career move into something creatively fulfilling, would like to discuss how your previous life and work experience might be useful as a designer, give us a call and have a chat. Or if you’d like to dip your toe into the water and try out the basic stages of the design process – discover, define, develop, deliver – then come and do an Inspiration Day with us, or give it to a loved one as a gift – we do gift vouchers.